Some longboarders are content to cruise. Others are satisfied with going fast down hills. For an intrepid few, though, the hiss of urethane when going sideways on pavement becomes an addiction. Freeride longboarding is riding on the edge of the envelope, pushing a board past the point of being safely hooked up and doing it on purpose. The best longboarding slide wheels don’t just allow this type of controlled recklessness; they make it possible. 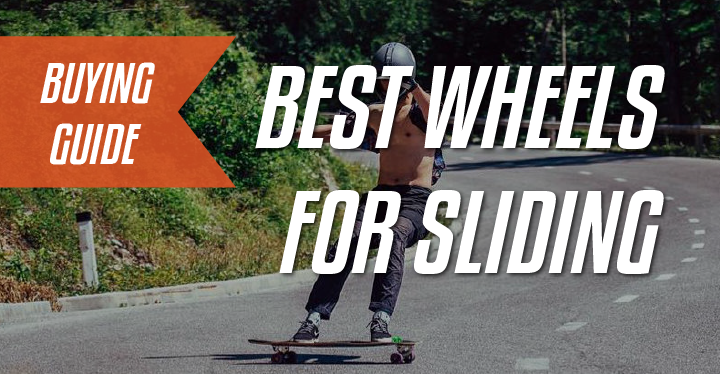 We take a look at the criteria that make slide wheels what they are below, but first we’ll call out a few of our favorites. Some are slide wheels that are capable of going fast, while some are race-oriented but can drift with the best of them. All are freeride wheels at their core. From one of the oldest and most trusted brands in longboarding come these buttery little beauties. Sector 9’s Skiddles are part of the company’s Slide Thane urethane formula family. Slide Thane is known for butter slides, and the Skiddles do not disappoint. They throw down predictable, tractable slides yet hook up easily. Skiddles are 70mm tall with a 78A durometer and a miniscule 28mm contact patch. 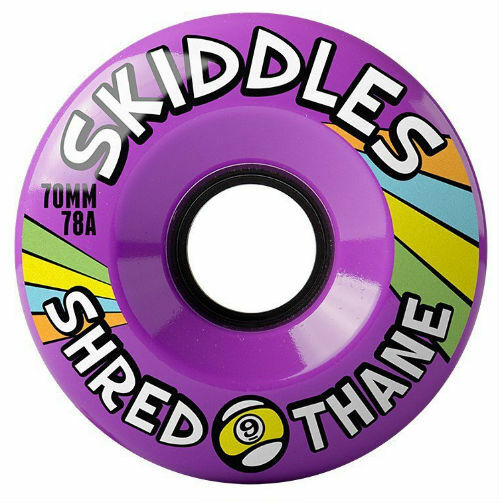 The thinness of the contact patch is part of the reason Skiddles slide so easily, but their urethane formula and round lip edges play roles as well. They are not deceptively soft or hard; think of a true 78A wheel and that’s how Skiddles feel. They have minimalist, offset cores that prevent users from flipping them to prolong their lives, though. Sector 9’s Skiddles are available in a variety of colors, and a mixed set of four different colors is also an option. The latter set leaves a satisfying rainbow of thane on the road, but any color will do the same, albeit in one hue. Their tendency to lay down chalky lines hints at a shortened lifespan, but Skiddles wear evenly and can be ridden practically to the core. Remember is an under-the-radar longboard company that produces some of the most interesting cruiser shapes available. The company also makes more traditional drop-through and pintail longboards, in addition to producing its own parts and accessories (under the Luxe brand name) and pads (under the 1 Tri label). 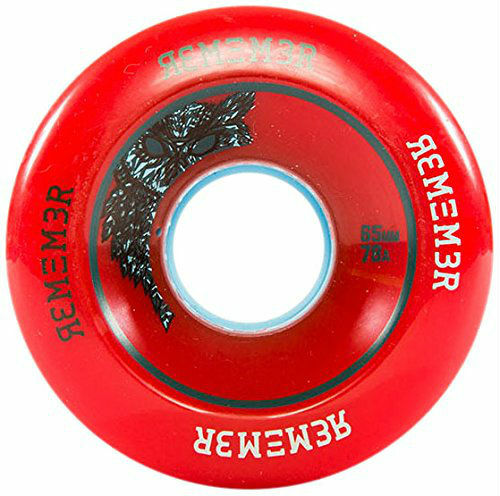 Remember Collective operates under Full Circle Distribution and is a sister company of classic skateboard and longboard manufacturer Madrid. At 65mm tall, Remember’s Lil’ Hoots are on the small side for freeride wheels. They have a 78A durometer and a 40mm contact patch, with rounded edges and beveled inner lips to ease kick out. Thanks to their icy urethane formula, the Lil’ Hoot is easy to get going sideways. Long, drifting slides are simple, even for the uninitiated. Slides are fast to the edge of insanity. The Lil’ Hoot is not, however, suitable for high-speed downhill. They have ample grip for freeride, but it is difficult to trust their hookup when the scenery gets blurry. Also, they are beveled differently on one side than the other, so they cannot be flipped to ensure even wear. Still, their formula is such that wear tends to be even anyway. Do one thing, and do it well. That is the key to Orangatang’s success. The company makes some of the most popular, most functional wheels in longboarding. Its wheels enjoy a reputation for providing the utmost in longevity and smoothness, and most Orangatang models exist to fulfill the requirements of one longboarding discipline or another. 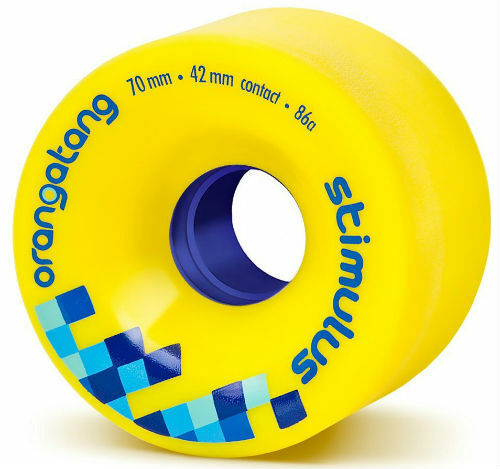 The Stimulus, though, is Orangatang’s do-everything wheel. It is 70mm tall, and it has a 42mm contact patch that results from severely rounded edges and beveled inner lips. The Happy Thane urethane formula is meant for speed, but the Stimulus will slide with the best longboarding slide wheels. Durometers are color coded and are available in 80A (orange), 83A (purple) and 86A (yellow). Orangatang calls the Stimulus its jack-of-all-trades wheel, which is an apt description. 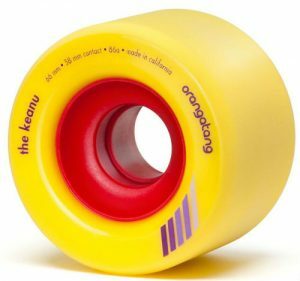 It has one of the widest overall widths (49mm) on this list, but Orangatang uses geometry and urethane formulation to get around the limitations of wider wheels. They provide plenty of grip for fast corners, yet they break into slides with a nudge. The term buttery was coined for the types of slides that the Stimulus produces, but it will transition from freeride to racing or just cruising without skipping a beat. If your favorite durometer is also your favorite color, cool. If not, too bad so sad. When it comes to Sector 9’s Butterballs, the name says it all. Butterballs are one of the most popular sliding wheels in longboarding. The reasons for their success lie in their ability to grip when necessary but drift when called upon. They eliminate the need to switch wheels for different roads or terrains. 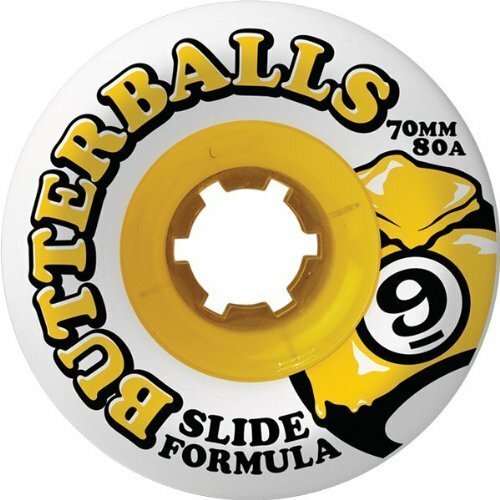 Butterballs are 70mm tall with a 38mm contact patch, and they have an 80A durometer. They’re not too tall, not too wide and not too hard or soft — the Goldilocks of slide wheels. Centerset hubs allow users to flip them for even wear, which is also aided by large-for-freeride cores. Round lips and a mellow bevel simplify kickout, but the wider contact patch means you still have to push them into a slide. Butterballs wear their freeride roots on their sleeves, but they are less of a do-it-all wheel than they might appear. While their urethane formula produces silky slides, it lacks the rebound to be truly fast. On roads with long straightaways, Butterballs lag behind more speed-oriented formulations. However, once the going gets twisty, Butterballs come into their own. Blood Orange is another one of the companies out there specializing in producing quality urethane for the discerning longboarder. It’s Liam Morgan pro model wheels are, like their namesake, always ready to throw down long, effortless slides at considerable speed. For those unfamiliar with Morgan, check out his laidback riding style in this Youtube video. Blood Orange’s Liam Morgans are 70mm tall and come in durometers of 80A, 82A and 84A. They drop from 46mm at their widest to contact patches of just 32mm, thanks to rounded and beveled edges. They are symmetrical, but because they have offset cores, they cannot be flipped. Those large cores do encourage even wear, though. 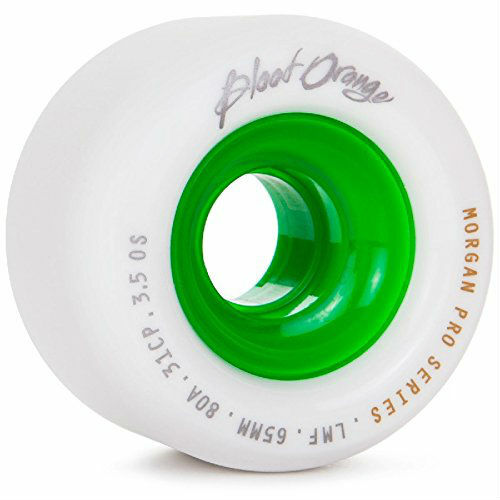 Morgan’s pro wheels are chalky and pure, leaving long and wide thane lines that make any longboarder beam with pride. They can handle downhill, but they are not racing wheels in the strictest sense. These Blood Oranges stay riding smooth after heavy use, though, producing predictable and consistent slides over a variety of terrains and on various downhill roadways. 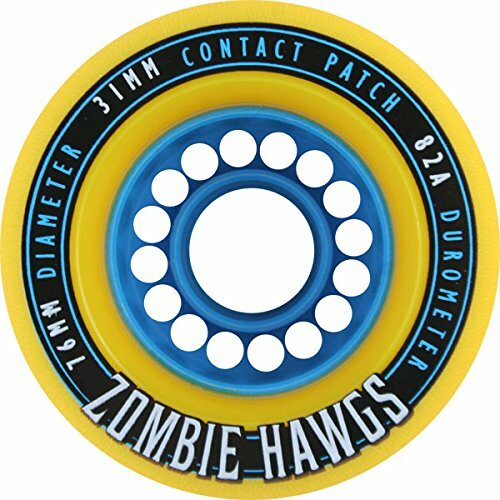 Zombie Hawgs have the rounded lip profiles and freeride-oriented formula to make learning to slide easy. With a 76mm height and 31mm contact patch, they are some of the tallest and thinnest wheels on this list, which helps them go fast and kick out easy. Extremely large cores impart stability when sideways, but they limit useable urethane depth to just 16.5mm. Their height makes them more suitable for drop throughs and drop decks than for top mounts. 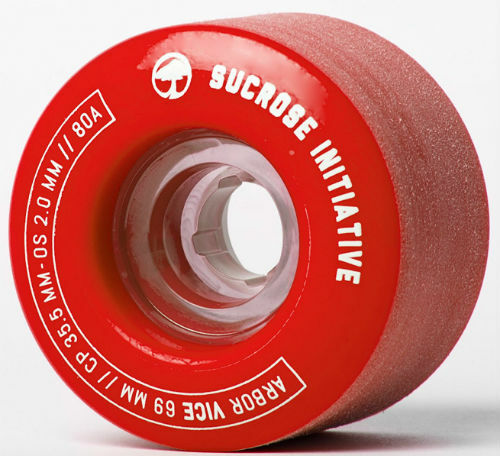 Calling Arbor’s Vice wheels sugary may seem redundant, made as they are with sucrose additives, but it’s a description that suits them. These smooth slide wheels are 69mm tall with 35.5mm contact patches. Their 80A durometer is a bit misleading, as they feel a bit softer thanks to their urethane formulation. Predictable and never icy, Vice wheels inspire confidence in the new-to-freeride longboarder. A lack of chalky thane lines might turn off the experienced freerider, though. From one of the oldest names in skating — and the innovator of Bones products — Powell Peralta’s Snakes are more freeride-capable than they are made-for-purpose freeride wheels. Their 69mm height puts them in the middle of this pack, but their 75A durometer is the softest on this list. That makes for a grippy slide wheel that handles rough terrain better than most, but one that is also markedly slower than the others here. Snakes are a great wheel to learn downhill slides on, though, because they prevent speeds from getting out of control. The Release is RAD’s do-it-all offering. The 80A red variety is well-suited for freeride, kicking effortlessly into buttery slides that are absent cheddar. Their 72mm height gives users a bit more thane to build speed on pavement than many others, but large cores limit their useful lifespan. Those cores are extra firm, though, preventing them from deforming and allowing for faster speeds and more consistent slides than much of RAD’s competition. At just 66mm in height, The Keanu is one of the smallest freeride wheels on this list, but what a ride. Buttery smooth when sideways yet tractable and grippy in a line, The Keanu is a favorite among experienced freeride longboarders. The 38mm core limits useful life, but a durable formula evens that out a bit. Those traits add up to more than their sum, preventing the rounded lips from deforming during drifts and teaming to provide the consistent feel that made these wheels famous. There is no such thing as the perfect longboard slide wheel. Practically any wheel can be forced to slide given enough speed and force, but no two wheels slide exactly the same way. Through trial and error, certain wheel characteristics have risen to popularity among the freeride longboarders. The following guide is not a checklist. Rather, it is a list of tried-and-true properties that have proven themselves in freeride longboarding. They are considerations to take, but they aren’t prescriptions. Ride what you like and forget the rules, but remember that wheel formulas or characteristics that work well in one situation but may be hazardous in another one. Terrain may be rougher or smoother; roads can be straight or serpentine, and your wheels can either accentuate your style or inhibit it. You can never have too many wheel choices. What makes a great slide wheel? This is the one characteristic of longboard wheels that is the most difficult to quantify. Manufacturers each have proprietary urethane (technically: polyurethane) formulas for each of their wheels. Wheel companies add different chemical ingredients in varying amounts to their formulations in efforts to eke out certain characteristics while suppressing or eliminating others. Each one of these additives plays a role in the final characteristics of a formula, and those characteristics determine how wheels slide. One urethane formula may make wheels that are slick and fast, with icy slides that are predictable on certain terrain. Another formula may produce silky smooth, buttery slides that are inherently predictable. A chalky formula will leave a bit of itself behind, drawing long ‘thane lines on the pavement. No one formula is correct or right; terrain and personal preference dictate all. Durometer is the wheel’s hardness. Manufacturers determine it by using a deformation test, and they give its value as a number followed by a letter, normally an A. Diameter is simply the height of the wheel. Given only these two numbers, it is possible to determine if a wheel might function well in freeride. Freeride wheels typically have diameters between 65 and 70 mm, while durometers normally run from 78A to 82A. Rider preference and board setup will dictate the best diameter for a given application. A preference for tall wheels won’t matter if they bite on the underside of the deck. Hardness is relative as well, as a 78A in one formula may feel harder than an 80A in another. Let the hill dictate the wheel. The lip profile is the area of the wheel where it transitions from vertical to horizontal, and it varies wildly on longboard wheels. 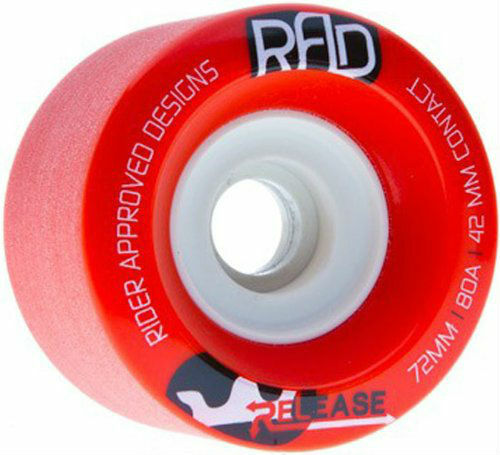 Typically, freeride wheels will have a rounded lip profile to make it easier for the rider to break traction and kick out into a slide. Compare the lip profiles of freeride and downhill wheels and you’ll see that downhill wheels have sharp edges. They are stable and they turn on rails, but it takes a lot of force to get them sliding. The rounded edges of most freeride wheels allows them to slide with much less effort, and also serve to keep contact patches minimized. The contact patch is the cross section of the wheel that actually makes contact with the ground. Wheel geometry varies between the disciplines and within each one, but sliding wheels will generally have thinner contact patches than most other longboard wheels. The reason freeride wheels keep contact patches small is simple: It reduces friction. The wider the wheel, the more of it is likely in contact with the ground. Wide contact patches are inherently stable, but they require a bigger push to get them sideways. 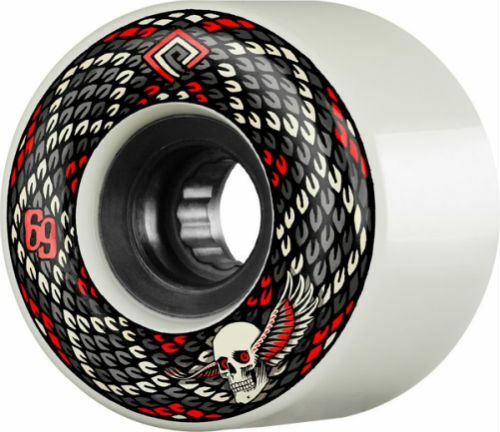 Cores serve multiple functions in longboard wheels, and each is important in freeride. First, they allow wheels to roll faster and more smoothly, retaining speed for longer periods of time. Also, they prevent the wheel from deforming too much during slides. The structure they provide allows wheels to wear evenly, regardless of the amount of ‘thane left on the road. Wheel cores may be centerset, offset or sideset. Centerset wheels are more stable and grippy, and they may be flipped to allow for even wear. Offset cores are only slightly off center. They allow for easier kick out into slides and hook up smoother than centerset wheels as well. Extremely sideset cores are sometimes unconducive to freeride, as wheels with this configuration tend to wear unevenly, but there are exceptions to this rule as well. Like most other wheel characteristics, choosing a core placement is a matter of personal taste and intended terrain. When riding hills that have long straightaways, offset cores can break the monotony with easy slides. When the going gets curvy, the extra grip of centerset wheels may help them outperform offset wheels, even if they are more difficult to kick sideways. Either experiment to find your happy place, or invest in multiple wheels for various terrains. Choosing freeride wheels is such a personal endeavor, it would be impossible to select one go-to wheel for everyone. There are those who prefer an icy slide because it goes for days, though others might call such wheels dangerous. Likewise, some longboarders are in it more for speed, though they may want to be able to push into a buttery slide sans cheddar. The key is to know your own style and to narrow your selection to wheels that accentuate it on your local roads.